Complications after pelvic sarcoma surgery are frequent; however, the reports on complications are limited. Results of the authors' experience with 110 primary pelvic tumor resections and methods to achieve low complication rates for pelvic reconstruction are reported. From 1982 to 1996, 110 patients with pelvic sarcoma (42 Ewing sarcomas, 40 chondrosarcomas, 21 osteosarcomas, and 7 other malignant tumors) underwent surgery. Sixteen patients underwent implantation of a hemipelvic megaprosthesis, 13 patients had implantation of an allograft for sacroiliac arthrodesis, 12 patients had implantation of an autograft for sacroiliac arthrodesis, and 17 patients underwent hip transposition. There were 9 hindquarter amputations, 6 implantations of allograft and total hip endoprosthesis, 1 implantation of prosthesis with autograft, and 1 implantation of allograft and autograft. No skeletal reconstruction was done in 35 patients. Postoperative function was as follows: 37% in patients with prosthesis, 60% in allograft, 66% in autograft, 66% in hip transposition, 37% in amputation, and 79% without reconstruction. 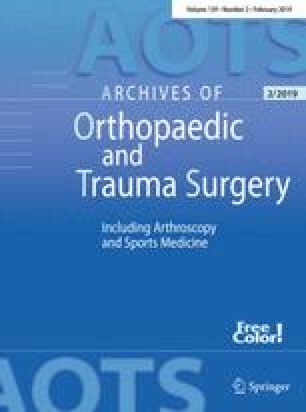 In total, 10/16 patients with prosthetic replacement, 9/13 with allograft implantation, 4/12 with autograft implantation, 7/17 with hip transposition, 5/9 with amputation, 6/6 with prosthesis and allograft, and 12/35 without skeletal reconstruction had complications. Frequent complications depending on the reconstruction were infection in 6/10 prostheses and in 5/13 allografts, leg length discrepancy in 2/12 autografts and 4/17 hip transpositions, hematoma in 3/9 amputations, and infection (6) and skin problems (5) in 6 prostheses with allograft. Because of the small number of complications and good function, autograft implantation after iliac resection and hip transposition after acetabular resection are advisable.